In the photo above: From left: Martin Nohe, chairman of the Northern Virginia Transportation Authority, launches the update of the organization’s TransAction transportation plans for the region with Authority member and Chairman of the Fairfax County Board of Supervisors Sharon Bulova. Dr. Dee Allsop, CEO of Heart+Mind Strategies, was available for questions regarding the survey his company conducted for NVTA as part of the update process. Photo by Andrea Worker. Northern Virginia Transportation Authority launches work on a six-year TransAction program. 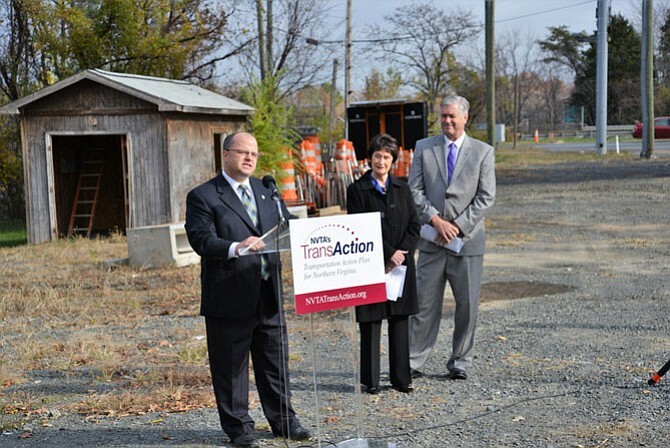 Members of the Northern Virginia Transportation Authority (NVTA) chose an appropriate location to announce the launch of the organization’s TransAction update efforts last week. NVTA chairman Martin Nohe, a supervisor on the Prince William County Board of Supervisors, and Sharon Bulova, chairman of the Fairfax County Board of Supervisors and a member of the NVTA, met with other transportation agency representatives and members of the media in a gravel-filled construction staging area alongside the interchange between Route 7 and the Dulles Toll Road. In the months to come, the ground they stood on will be transformed into a major component of a roadway expansion and improvement project in the heavily trafficked area. IN AUGUST, NVTA began a major update to TransAction 2040, the plans developed to address transportation in Northern Virginia through the year 2040. It is the first update to the plan since the passage of HB 2313 by the Virginia Legislature in 2013, the bill that provided the region with a sustainable, dedicated revenue stream of more than $300 million annually with which to tackle the transportation problems of the nine jurisdictions that are covered by the NVTA. Many residents in those jurisdictions don’t know that NVTA has a comprehensive, long-range transportation strategy. A recently completed survey, commissioned by the NVTA as part of the update, revealed that only 8 percent of Northern Virginians were aware of the existence of TransAction. “In fact,” said Nohe, “the number may be even lower,” since he believes that some respondents may have answered that they were aware of the plan “without really knowing what it’s all about.” Some might not even know about the NVTA itself. These are two omissions of knowledge that Nohe and the NVTA have plans to remedy. A new, interactive website is step one of the NVTA’s endeavor to educate the public and will include a number of “avenues to participate” in the process. Both the NVTA’s web site, www.thenovaauthority.org, and the new site, www.NVTAtransaction.org provide easy-to-read documents that describe and track the organization’s many projects, either completed, in progress, or on the books. Next will be a major outreach campaign. NVTA staff will be heading out, armed with tablets, to “the places where people live, work, and play,” said Nohe, educating, but more importantly, gathering input from constituents. The NVTA can speak with one voice on behalf of Northern Virginians, but Nohe and Bulova acknowledged that transportation problems and potential solutions were not necessarily “one-size fits all” across Planning District Eight, from rural portions of Loudoun County to the congestion faced by residents of Arlington, or from Metrorail users to drivers on the choked major arteries connecting the region. Input from all areas is essential to the success of any plans and critical to meeting the authority’s mandate. THE UPDATE process is expected to last about two years, targeted for completion in late summer/early fall of 2017. When adopted, the final version of the update will be known simply as TransAction and it will guide the NVTA’s Six Year Program, covering FY2018-2023, and allocating over $1 billion to multi-modal transportation improvements during that period.